Following its highly successful Kaypro II, Kaypro Corporation continued to release a series of refined CP/M models up to 1986. They all looked very similar, with a robust metal case, detachable keyboard, an 80-column green screen on the left and a set of drives on the right. Each one differed in hardware capability though, either slightly or in a major way. Getting to grips with the different Kaypro models takes some head-scratching as they are numbered in an inconsistent (even bizarre) way. Sometimes roman numerals were used, sometimes arabic ones. Sometimes they were not even in order. 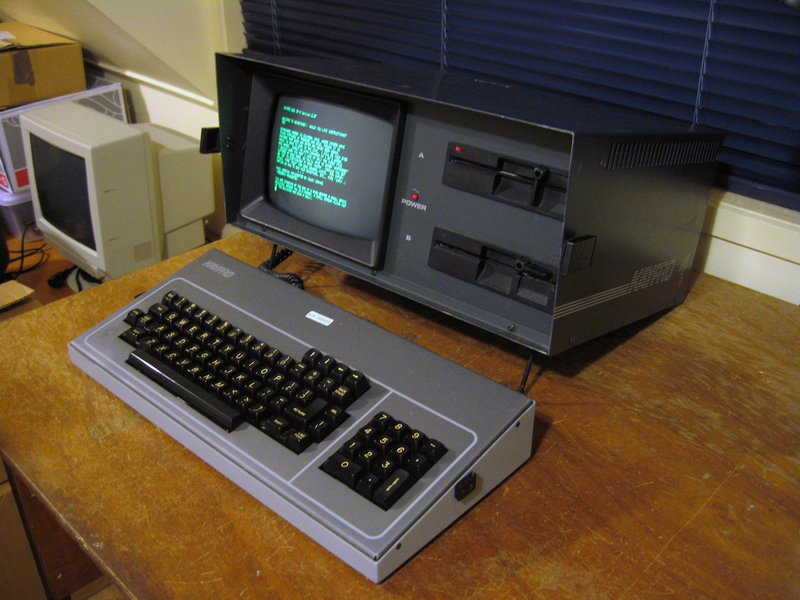 For example, the Kaypro II was released in 1982 while the Kaypro 1 appeared in 1986?? The Kaypro 4 made it debut in 1984. Improvements over the original Kaypro II were a new colour scheme, two half-high double-sided drives giving 390k storage, a 4MHz processor, graphics capability, a cooling fan, a fold-out stand so the unit didn't have to balance on the keyboard, a built-in modem and a real-time clock. The software bundle had some new additions such as the highly-popular Wordstar. I wasn't really looking for another Kaypro model after the Kaypro II, but this one happen to fall into my lap. It needed some drive cleaning to get up and running but now it's fully stocked, loaded and ready to go. It's in excellent condition and looks great in its cool charcoal colour scheme. Having graphics capability you can even play space invaders on it! I've decided to let it stay.